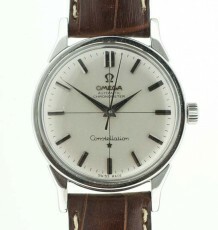 Classic stainless steel Omega Seamaster with 24 jewel Omega automatic calibre 565 using quick set date function. Beautiful sating silver dial with framed date window and genuine vintage beads of rice bracelet. 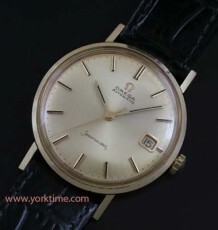 A stunning vintage Omega Seamaster with date indicator and quick set date function. This classic Omega Seamaster dates to 1966 based on the serial number of the 24 jewel calibre 565 movement, whihc also uses the quick set date function of pulling out the crown to advance the date wheel. The watch has a spectacular satin silver dial with radial satin pattern and a silver framed date window. The silver coloured stick hour markers and steel hands use black Onyx inlays to highlight visibility against the light background colour of the dial. 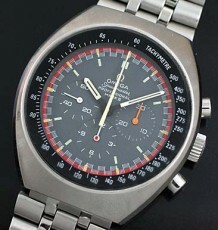 The case shape is the traditional shape as opposed to some of the more whacky shapes and styles Omega began experimenting with towards the end of the 1960’s. 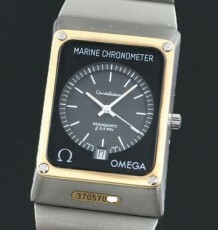 The model features a substantial steel screwed on case back emblazoned with the Omega Seahorse logo. The watch was just serviced by my watchmaker and is keeping excellent time. 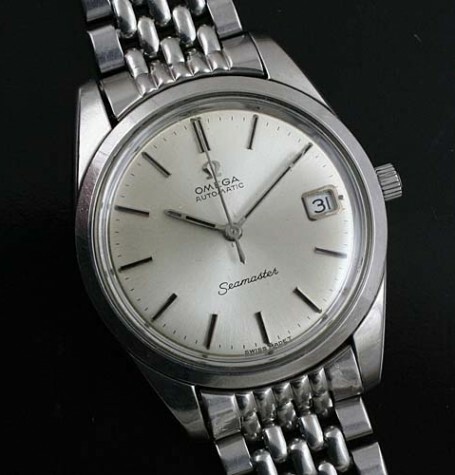 A new genuine Omega hesalite crystal was just fitted and also note the original Omega signed crown. The case measures 35 mm wide by 43 mm long. The genuine Omega vintage beads of rice bracelet will fit up to a 7.5 inch wrist.